Something strange has been taking place at Wanneroo City SC this year. Walking Football has taken off and is now a regular feature in the club’s playing activities. Walking football is a variant of soccer that is aimed at keeping people aged over 50 involved with football if, due to a lack of mobility or for other reason, they are not able to play the traditional game. All the rules of the traditional game are similar, except for one major variation; only walking is allowed. There are many benefits for people having a go at Walking Football, with its popularity taking off both in the UK and here in Australia. Apart for the obvious health benefits of being active, both mentally and physically, there is the comradery that comes form joining in a team participation sport. 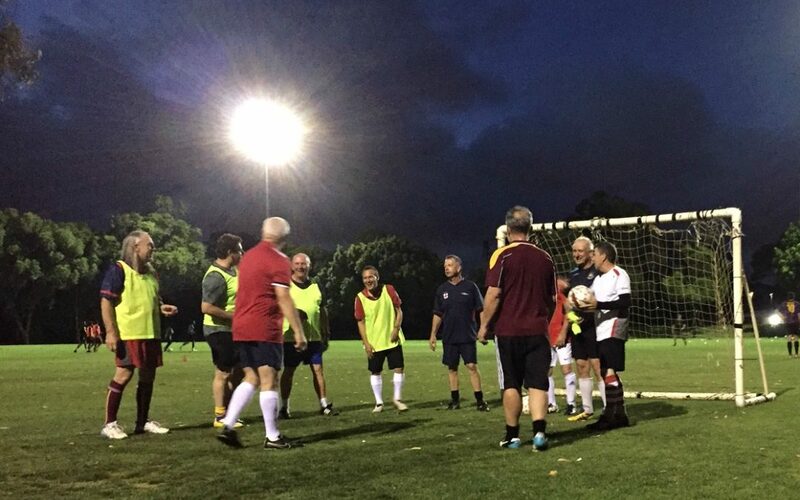 Walking Football at WCSC is played outdoors on a grass pitch, under lights. With the approaching warm nights, it is the ideal summer activity for anyone interested in playing. Games kick off at 7pm on Wednesday evenings and anyone interested in playing can contact David Udy on 0476 404 570 or info@theroos.com.au for more details.